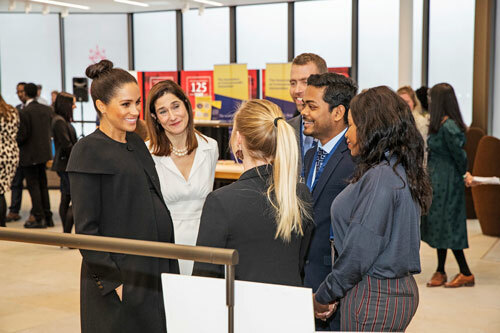 HRH The Duchess of Sussex visited City, University of London to attend an engagement with the Association of Commonwealth Universities (ACU) on Thursday 31st January. It was Her Royal Highness’ first official visit to the ACU in her new role as Patron of the international organisation which is dedicated to building a better world through higher education. The engagement was held at City, University of London, which is one of the ACU’s 500 university members. The ACU supports the development of higher education as a power for good across the Commonwealth and beyond. The Duchess was welcomed to City by its President, Professor Sir Paul Curran and Dr Joanna Newman, ACU Chief Executive and Secretary General. As a university graduate, Her Royal Highness is a strong advocate of accessible education for all, and as part of The Duke’s and Duchess’ visit to Fiji last year, Her Royal Highness announced new Gender Grants for ACU member universities in the Pacific to fund new learning initiatives aimed at empowering female university staff and promoting gender equality. This year, 2019, also marks the 60th anniversary of the Commonwealth Scholarship and Fellowship Plan and the launch of the Queen Elizabeth Commonwealth Scholarships, which build Commonwealth connections among students through education. Her Royal Highness met past and current scholars to hear how the prestigious scholarships have provided access to higher education. 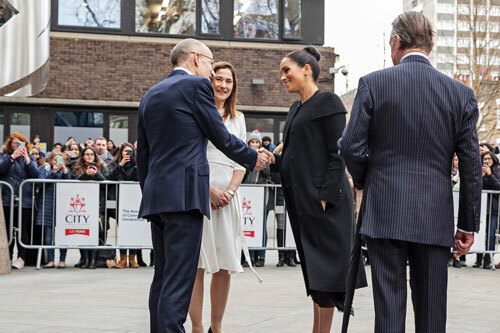 During the visit, The Duchess heard more about how the ACU is working to promote inclusion and access to education for underrepresented groups and spoke to students about their research in the fields of sustainability; global health; and peace and reconciliation. "Today was a fantastic opportunity to demonstrate how the ACU brings together people from across the Commonwealth and beyond through our unique network of universities, to advance knowledge, promote understanding, broaden minds, and improve lives. We're looking forward to continuing to work with The Duchess as our Patron". “It was an honour to welcome Her Royal Highness to City as Patron of the Association of Commonwealth Universities. “City is one of the UK’s most popular universities for international students and staff, notably those from Commonwealth countries, so we were particularly proud to host her visit. Our membership of the ACU, the world's first international university network, is something in which we take great pride”. Established in 1913, the ACU is the world's first and oldest international university network, with more than 500 member institutions in over 50 countries. It is the only accredited organisation representing higher education across the Commonwealth. The ACU champions higher education as a force for good in the Commonwealth and beyond. Among its key principles is the value of higher education to society – or its role ‘as a common good’ – and the conviction that this value is enhanced by international collaboration. The ACU manages international scholarship schemes, convenes universities to address key policy challenges such as climate resilience and peace and reconciliation, and promotes the role of universities in delivering the UN Sustainable Development Goals.